About BEARS | BEARS Welcomes You! The Broadcast Employees Amateur Radio Society, Inc. (BEARS) is a 501c3 charitable service organization, representing the amateur radio community at the The Walt Disney Company in greater New York. Founded in 1975, BEARS operates the W2ABC/N2BEI/K2JRC linked ham repeater system, comprising VHF and UHF repeaters throughout the NYC tri-state area and in Washington, DC. Together with DEARS, the Disney Emergency Amateur Radio Service at Walt Disney World in Orlando, FL; the Pixar Amateur Radio Club in Emeryville, CA; and the Worldwide Amateur Radio Club at ESPN in Bristol, CT, BEARS operates DARI — the Disney Amateur Radio Interconnect — which networks repeater systems at Disney facilities in NY, FL and CA, along with affiliated systems in greater Washington, DC, greater Boston, MA, and Long Island, NY via full-time RF and/or proprietary IP links. 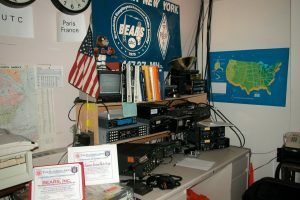 The BEARS Amateur Radio Operations Center is located at 125 West End Avenue, Room 606 — and is accessible ONLY to BEARS members employed by The Walt Disney Company (and guests escorted by BEARS members employed by TWDC). BEARS is affiliated with the American Radio Relay League and is an ARRL Special Service Club. We put our repeaters and our emergency communications van at the disposal of public and private disaster response organizations, and we conduct VE sessions to train, license and/or upgrade new and currently licensed hams. Membership in BEARS is free of any cost or other obligation, and is open to all licensed and prospective amateur radio operators, regardless of whether they are affiliated with The Walt Disney Company (although executive officer and certain other leadership positions within BEARS are limited constitutionally to TWDC employees and/or retirees). For more information about BEARS, e-mail President@W2ABC.org, or call 212-456-1073.